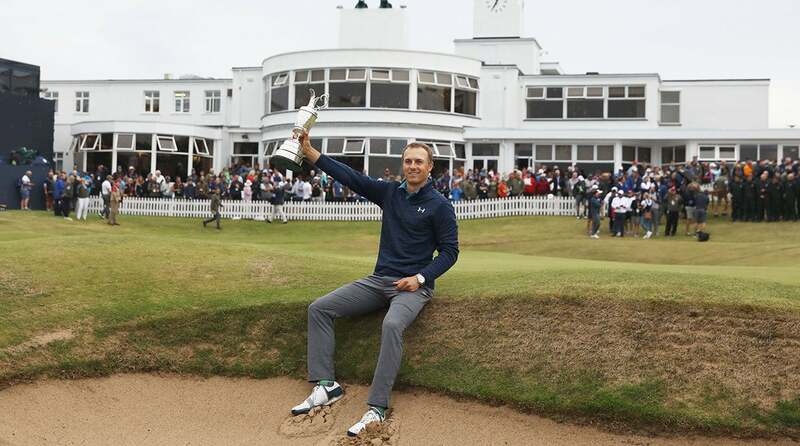 Thanks to his memorable finish at Royal Birkdale in 2017, Jordan Spieth added a juicy storyline for every time the PGA Championship rolls around — a quest to complete the career grand slam. The slam, winning all four of golf's majors — the Masters, U.S. Open, British Open and PGA Championship — is one of the sport's greatest feats. It's been accomplished just five times, and some of the game's best — Arnold Palmer and Tom Watson among them — have come up short. A single-season Grand Slam, winning all four in a calendar year, has never been accomplished in the post-Masters era. Bobby Jones, golf's greatest amateur, is the only player to have ever won the pre-Masters slam. In those days, the U.S. Open, British Open, U.S. Amateur and British Amateur were considered golf's four majors. In 1930 he won the British Amateur at the Old Course, British Open at Hoylake, U.S. Open at Interlachen and U.S. Amateur at Merion. It's widely considered one of the greatest seasons in golf history. Tiger Woods coined a new term in 2000, when at one point he held all four major trophies yet didn't win them all in the same calendar year. That feat is commonly known as the Tiger Slam. Here's a quick look at those who have cemented their names in history, and those who have a shot to join the exclusive club. Gene Sarazen Completed: Age 32 Order: 1922 U.S. Open, 1922 PGA, 1932 British Open, 1935 Masters Starts needed: 36 Number of slams: 1 Total major titles: 7 Briefly: Sarazen became the first player to notch the career slam with the four current majors used as the benchmark. He won his first major, the U.S. Open, in 1922 and completed the slam 13 years later at the 1935 Masters, which was in its second year of existence and known as the Augusta National Invitational Tournament. He won that '35 Masters in a playoff over Craig Wood, but it was what he did earlier during his final round that lives on in golf lore. Playing the par-5 15th hole, Sarazen hit a 4-wood from 235 yards and holed out for an albatross. It's been since known as the "Shot Heard ‘Round the World." Ben Hogan Completed: Age 40 Order: 1946 PGA, 1948 U.S. Open, 1951 Masters, 1953 British Open Starts needed: 33 Number of slams: 1 Total major titles: 9 Briefly: Hogan had already won three legs of the slam by the time the 1953 season rolled around and his historic run began. He won his second Masters and fourth U.S. Open that year, and then showed up to Carnoustie two weeks early to prepare for the British Open, which he won by four. It was the first and only British Open he ever played. He couldn't attempt a calendar-year slam that year because the PGA Championship and British Open overlapped on the schedule. All told, Hogan won five of the six tournaments he entered in 1953, making it one of the greatest seasons in golf history. Gary Player Completed: Age 29 Order: 1959 British Open, 1961 Masters, 1962 PGA, 1965 U.S. Open Starts needed: 29 Number of slams: 1 Total major titles: 9 Briefly: Player needed only four major victories to complete the feat. It started with the 1959 British Open and was capped with his two-shot victory at the '65 U.S. Open in a playoff over Kel Nagle. Player came close to a second slam, but he never won the U.S. Open a second time (he was twice a runner-up). Jack Nicklaus Completed: Age 26 Order: 1962 U.S. Open, 1963 Masters, 1963 PGA, 1966 British Open Starts needed: 27 Number of slams: 3 Total major titles: 18 Briefly: When he completed the slam in 1966, Nicklaus surpassed Player as the youngest ever to win all four majors. His first major was the 1962 U.S. Open; he added the Masters and PGA Championship in 1963 and won the British Open at Muirfield in 1966. (He also won two more Masters before completing the slam.) Nicklaus went on to win the slam three total times. Tiger Woods Completed: Age 24 Order: 1997 Masters, 1999 PGA, 2000 U.S. Open, 2000 British Open Starts needed: 21 Number of slams: 3 Total major titles: 14 Briefly: Woods created the "Tiger Slam" in 2001, when he held all four major trophies at one time but didn't win them in the same year. He won the U.S. Open, British Open and PGA Championship in 2000 — the first two by a combined 23 strokes and the latter in a playoff — and then made it four straight major victories by winning the 2001 Masters. His British Open victory at St. Andrews during that span gave him the first of his three grand slams and broke Nicklaus' record of youngest to complete the feat (and by two years). Thirteen players have conquered three of the four legs of the slam — among them Walter Hagen, Sam Snead, Tom Watson and Arnold Palmer — but only three are still active: Rory McIlroy, Phil Mickelson and Jordan Spieth. Here's where they stand. Phil Mickelson Age: 48 Order: 2004 Masters, 2005 PGA, 2013 British Open Starts to get to three legs: 83 Total major titles: 5 Missing: U.S. Open Best chance at missing major: Where do we begin? There was Pinehurst No. 2 in 1999 when Payne Stewart out-dueled Mickelson down the stretch; 2002 when he finished second to Tiger Woods; 2004 when he was Retief'ed by Retief Goosen; 2009 when Lucas Glover had the last laugh, and 2013 when his 54-hole lead at Merion didn't last. But of all his chances, 2006 at Winged Foot takes the cake. Needing to par the 72nd hole to win or make a bogey for a playoff, Mickelson made double bogey and handed the trophy to Geoff Ogilvy. "I am such an idiot," Mickelson famously said afterward. It all adds up to a record six U.S. Open runner-up finishes. Mickelson has yet to seriously contend at a U.S. Open since he notched the third leg of the slam at Muirfield in 2013. He finished outside the top 20 in 2014 and 2015, missed the cut in 2016, skipped the event in 2017 to attend his daughter's high school graduation and never contended in 2018. There's still time, but it's running out. Rory McIlroy Age: 29 Order: 2011 U.S. Open, 2012 PGA, 2014 British Open Starts to get to three legs: 24 Total major titles: 4 Missing: Masters Best chance at missing major: McIlroy's best chance to win came in 2011, when as a 21-year-old he held a four-stroke lead after 54 holes. He shot 80 on Sunday and tied for 15th, and two months later he won his first major by lapping the field at Congressional. He's finished in the top 10 in each of the past five years. He was in the final pairing in 2018 but wasn't able to catch eventual winner Patrick Reed, who was spotted a three-stroke lead to begin the day. Jordan Spieth Age: 25 Order: 2015 Masters, 2015 U.S Open, 2017 British Open Starts to get to three legs: 19 Total major titles: 3 Missing: PGA Championship Best chance at missing major: If it wasn't for Jason Day's record-setting week at the 2015 PGA Championship at Whistling Straits, Spieth might already have the career grand slam in his pocket. Day won at 20 under, which at the time was the lowest score in relation to par in major history. Spieth, playing alongside Day in the final pairing Sunday, finished solo second, three strokes behind Day and two strokes clear of third place. In Spieth's first attempt to capture the slam, at Quail Hollow in 2017, he tied for 28th.